A Cal 20 is eligible to compete in one-design competition only if it has a valid Class measurement certificate and races in the configuration of that certificate, has been properly registered, and is owned by an Active or a Special Member of the Association. Skippers in one-design Class races shall be Active or Special Members of the Association. The skipper entered in the Championship Regatta must be the same helmsperson in the elimination series. All members of the crew must be Corinthians. Any series for a Cal 20 Championship territorially greater than one Fleet, or events for perpetual or semi-perpetual trophies, must be sanctioned by the Fleet in whose water the event is held. The Executive Committee may outlaw any event for cause. One HONOR AWARD chevron may be displayed on the mainsail representing the skipper's highest achievement within the Class. Honor awards are presented to the skipper, not to the boat. They shall be retained by the skipper for use on any Cal 20 that he or she may sail while a member of the association. The Cal 20 Class Championship shall be held annually to determine the champion of the Cal 20 Class. The Cal 20 Class Champion Perpetual Trophy shall be held by the winning Fleet or Unattached Member until the next Class Championship series, subject to the approval of the Executive Committee. The Class Championship regatta is an open event until such time as the Governing Board deems it necessary to make it a restricted event. The Governing Board shall set the method of determining qualifications for the right to enter the regatta. The allocation for each Fleet will be based on the number of Cal 20s owned by Active Members in the Fleet. The Governing Board shall announce the allocations, if any, on or before May 1 of each year. In order to qualify for the Class Championship, the skipper/helmsperson must be an Active member who has owned 1/3 of a Cal-20 for at least three months. 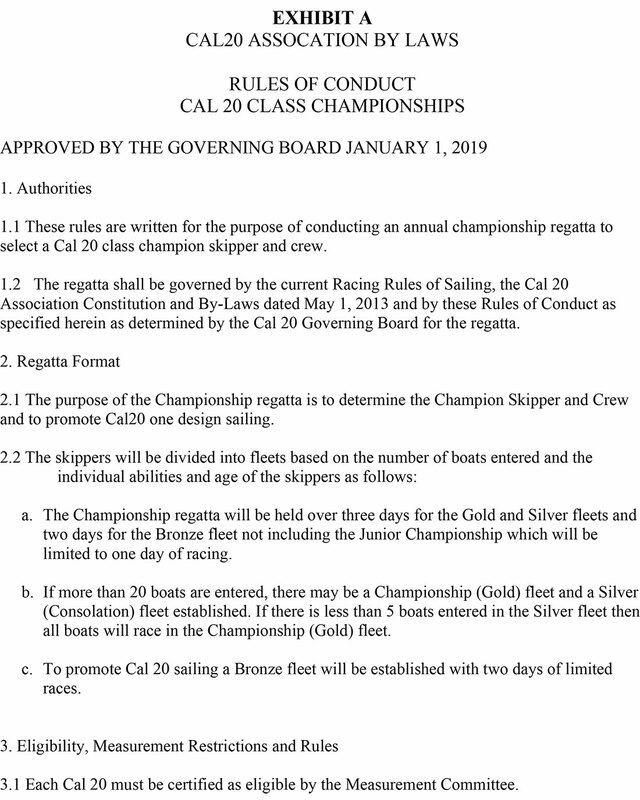 With prior approval from the Class Championship Committee, a skipper who qualifies may sail a Cal-20 other than the boat in which he or she qualified. Each Cal 20 must be certified as eligible by the Measurement Committee and the Secretary of the Association prior to the first race. The Race Committee or the Measurement Committee may require a re-measurement of the hull, spars or sails at any time prior to the trophy presentation. The Cal 20 Board of Directors will schedule the venues for Class Championship regattas after carefully evaluating locations that will best help the development of the Cal 20 Class and of individual fleets within the Class, and will provide enjoyable and fair racing to the members of the Association. 5. The responsibility for arranging and providing proper facilities, entertainment, prizes, etc. shall rest with the Fleet on whose waters the series is held. In this regard the host Fleet shall be guided by the Governing Board and the Class Championship Committee. The Championship Regatta will be governed by the rules as approved by the Governing Board attached hereto as Rules of Conduct (Exhibit A). Total crew for each boat in Class Championship competition is limited to a maximum of four persons and a minimum of two. Children under twelve years old are not counted as crew. No Cal 20 shall be prevented from entering a re-sail of any uncompleted race for any cause arising out of an incomplete race. The official number allocated to each Cal 20, shall be permanently molded or stenciled in legible numbers in a visible place on an interior surface of the hull. Construction of all hulls shall be of molded fiberglass in or over an approved mold manufactured by Jensen-Wenke or its successors. Hull shape or hull-stiffening modifications are not allowed except as necessary for repairs. In those cases, proof of return to a pre-repair condition shall be certified and approved by the local Fleet measurer. Because of the assumed impact on boat speed, any strengthening or stiffening below the waterline shall be disallowed except where absolutely necessary to preserve integrity. Limited strengthening above the waterline which does not affect boat speed (such as mast support members or hatchway corners) may be approved by the local measurer if it's deemed necessary to preserve the integrity of the boat. A single fore and aft stringer may be installed on each side of the bow to reduce bow deflection (oil-canning). The stringers must be located inside the hull, horizontally, halfway between the forepeak berth and the deck. The stringer must terminate before the mast step deck beam or the bulkhead. It may be wood, foam or PVC material and must be bonded to the hull. The maximum profile dimension of the stringer cannot exceed two inches. Major repairs above or below the waterline must not exceed the original strength or stiffness, or lighten the boat from its pre-repair condition. Such repairs are to be made with similar materials when possible, i.e. resin for resin, wood for wood of similar density, weight, strength and stiffness. Polyester resin may be replaced with epoxy resin. When original materials, replacement parts or their equivalents are not available for timely refurbishment or repair, a member may petition the Chief Measurer for permission to use substitute parts or materials. A single cockpit support connecting the cockpit floor to the cabin sole pan may be installed to prevent cockpit corner cracking. The use of carbon fiber and other "hi-tech" materials to provide equal or increased stiffness with a decrease in weight is strictly prohibited. Strengthening the upper and/or lower gudgeon fastenings with a backing plate, or a backing block mounted on the interior side of the transom, shall not be construed as a stiffening modification, and need not be approved by the local Fleet Measurer. Cockpit drainage through the motor well is required for all boats. Taping-over, glassing-in or sealing the motor well in any form is prohibited. The motor well must be self-draining and the well plug removable from the cockpit. The thickness of the plug is limited to 3 inches. Any attempt to fill the well with foam is illegal. Boats not equipped with a motor well by the builder shall carry 20 pounds of ballast weight in the location of the missing motor well. Adequate cockpit drainage is required. The leading and trailing edges of the mounting flange may be faired into the hull. A .25 inch fillet is allowed between the sides of the flange and the hull. 18 inches down from flange: 45.625 inches. The bulb may be faired but not altered in shape. 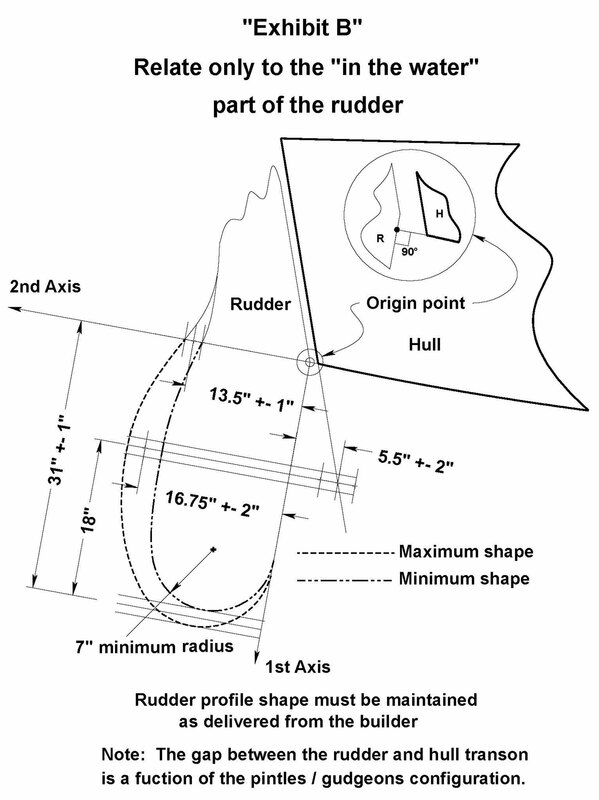 The rudder must weigh at least 25 pounds with gudgeons or pintles, and have a maximum thickness of no more than 2.25 inches. The rudder profile shape must be maintained as delivered from the boat's builder, as shown on Exhibit B. The "origin" point for the rudder profile control dimensions is on the rudder's in-the-water leading edge or its continuation. This point is established by intersecting the rudder's leading edge with a perpendicular line to the bottom of the transom's center line. The first axis is established by connecting the origin with the tangent point between the arc of the leading edge and the circular arc of the bottom of the rudder. The second axis is established by a line through the origin, perpendicular to the first axis. Chord lengths are measured between the leading edge and the trailing edge perpendicular to the first axis. The bottom of the rudder is defined as a line tangent to the circular arc at the bottom of the rudder and parallel to the second axis. The chord length along the second axis shall be 13.5 inches, plus or minus 1 inch. The chord length 18 inches above the bottom of the rudder shall be 16.75 inches, plus or minus 2 inches. The depth as measured from the origin to the bottom of the rudder along a line parallel to the first axis shall be 31 inches plus or minus 1 inch. The trailing edge must be convex. The lower curve shall be a 7-inch minimum radius circular arc tangent to both the leading and trailing in-the-water edges. The aft rake, measured from a point 18 inches above the bottom of the rudder, shall be 5.5 inches, plus or minus 2 inches from a point aft of the distance measured from a straight line from the transom. Tiller to be removable and made of wood or aluminum. HATCHES: All hatches must be carried on board while racing. The main hatch slider and crib board must be constructed of wood, fiberglass or plastic. The main hatch slider must be carried in place and there may not be any fastened obstruction that limits the horizontal opening of the hatch to less than 16 inches. The cockpit lazarette hatch must be hinged and functional. Specifications, however complete, cannot anticipate every situation that may arise. If a point is not covered, or governed by the dictates of common sense, a ruling must be obtained from the Measurement Committee. In interpreting any point not covered, or words of obscure meaning, the Measurement Committee will consider the intended meaning rather than any technical mis-construction that may be derived from the wording. Rulings shall be based on the principle to maintain the Cal 20 as designed by C. William Lapworth, built by Jensen-Wenke or its successors, and configured as allowed by the Association Bylaws. Questions regarding the interpretation of Bylaw restrictions, specifications, or the legality of anything about the boat, rigging, sails or equipment, shall be referred in writing to the Chief Measurer. The Measurement Committee shall make a prompt decision which shall be published in the following issue of the Association newsletter or web site. Rulings and decisions made by the Measurement Committee during the preceding 12 months shall be submitted to the membership for ratification by April 1 each year. Partners in a boat must vote as a single entity-one vote per boat. Returned ballots must be postmarked prior to May 15 to be counted in the tally. If ratified by a simple majority of the votes cast, these rulings shall be added to the Bylaws. If rejected, they become null and void effective July 1 or at the Class Championships-whichever comes first. Rulings made by the Measurement Committee after April 1 become effective immediately after the Class Championship. A Cal 20 must have a valid measurement certificate that is no more than two years old to compete in any sanctioned one-design event. Any subsequent measurement supersedes all previous certificates. Fleet Measurers shall be elected by their respective Fleets and shall derive their authority from the Chief Measurer. Measurers shall not measure their own boats. A new measurement certificate may be required if alterations or repairs affect more than half of the hull, or are extensive enough to warrant a re-measurement in the opinion of the Measurement Committee. WAIVERS: A boat that does not measure within stated specifications due to factory tolerances may petition for a waiver. Only "as-built" variations that are not correctable in a reasonable and practical manner are eligible. The measurer may use any means to verify the need for a waiver, including disassembly or drilling, with any cost borne by the petitioner. Such waivers shall relieve only the subject tolerance and shall not permit broader modification. Waivers shall be requested by the appropriate Fleet Measurer, approved by a majority of Fleet Captains, and issued by the Association Measurer. Waivers may be subject to yearly review when so requested by any three Fleet Captains. Reasonable grounds must be shown before a Cal 20 with a valid measurement certificate can be subject to a re-measurement or a protest of measurements. Each measurement protest of a certified Cal 20 must include a $15.00 filing fee, which is returnable if the protest is sustained. A Cal 20 is always subject to re-measurement by order of the Governing Board, Measurement Committee, or the Class Championship Committee, in which case the filing fee does not apply. All boats shall weigh a minimum of 2040 pounds with only the required equipment on board. For the purposes of this article, a Cal 20 consists of a hull and deck (including items permanently bonded or affixed to them), cast iron keel, standing rigging, running rigging, rub rails, rudder, tiller and spars. All items included in the minimum weight must be carried aboard while racing. Safety equipment of Article XIII – Section 1. Main hatch slider and crib boards. Berth drop boards (3/8" plywood). BALLAST: Any boat weighing less than 2040 pounds in measurement trim shall add ballast to bring the boat up to the minimum weight. Ballast is defined as materials serving no useful purpose aboard a Cal 20 other than dead weight. However, all or part of the ballast may be comprised of an engine and fuel. Also, a battery, not including cable ties or supports, and/or a portable marine head may be used as ballast. Required ballast weight, if any, shall be listed on each measurement certificate. Ballast shall not be moved while racing, and its removal shall void the certificate. The mast and boom shall both be made of oval, hollow extruded marine grade aluminum. The wall thickness must be uniform for the full length of the extrusion. Redistributing or reducing weight is not allowed but internal reinforcement is permitted in the bottom 9 feet of the mast section and reasonable boom reinforcement is allowed in the area surrounding the boom vang connection. Only boats that came from the builder with a tapered mast as original equipment are allowed to have a tapered mast (hull numbers 1-124). If the original mast is replaced for any reason, it shall be replaced with a non-tapered mast in accordance with class rules. The minimum allowable boom circumference is 7.0 inches. Visible bands of a contrasting color shall be affixed to the mast and boom. The distance from the top edge of the bottom mast band to the bottom edge of the top mast band shall not exceed 23 feet 0 inches. The top edge of the bottom mast band shall not be more than 30 inches above the deck. The distance from the aft edge of the mast to the forward edge of the boom band shall not exceed 10 feet, 0 inches. Non-standard mast or boom configurations or controls are not allowed. This includes, but is not limited to, coring or cutting holes in the spars for the purpose of reducing weight, permanently bent spars, rotating masts and spar bending devices. An adjustable backstay is allowed. Forward lower shrouds are optional. Turnbuckles may be added above the spreaders to adjust the jumper shrouds. Standing rigging shall be stranded stainless steel wire. Minimum shroud and headstay wire size 3 millimeters (slightly larger than 1/8 inch). The minimum size for backstay and jumper wires is 3/32 of an inch. The spreaders shall not be less than 30 inches long, measured from the mast to the inner edge of the shroud. The headstay may be attached to a "bow tang" or steel strap, through-bolted to the bow, rather than to the stock plate on the foredeck, if the "J" measurement is not greater nor less than 7 feet, 4 inches (+1 inch or -0.5 inch). If the Cal 20 does not have a bow tang, the "J" measurement shall be as delivered from the builder. The load of the aft lower shrouds may be transferred to the main hull through the standard deck fitting and through-deck fittings to an interior chainplate via a turnbuckle, cable and/or tang. The backstay must be attached to the transom and may be split, up to a distance of ten feet above the deck, to permit a symmetrical arrangement. Internal mast tangs for the shrouds, headstay or backstay are not allowed. The mainsheet must be rigged as specified on the plans at all times. The quarter blocks must always be used in a normal manner, fastened to the top surface of the cockpit coaming. The blocks must be positioned aft of a line projected from the vertical surface of the cockpit seat. A double-ended continuous mainsheet or "head knocker" may be used if the mainsheet bridle system remains basically unchanged. Mainsheet travelers or other systems that control the boom or provide additional leverage are not allowed. There are no restrictions on jib sheeting systems. Downhaul devices on or near the tack of the jib are not allowed. Halyards must run externally along the mast. Halyard locks located above the gooseneck are not allowed. Any form of boom vang is permitted, as long as it is not capable of supporting or lifting the boom. Sails for Class racing shall be limited to a mainsail and a class jib. The cloth weight shall not be less than three ounces. The purchase and measurement of sails shall be limited to one suit per boat in each calendar year. During the first calendar year of class competition, one additional suit of sails is allowed. In the event of a legal sale of a Cal 20 in its entirety, it's considered that the boat is newly registered and thus in its first calendar year of competition, which permits the purchase of an additional suit of sails. In the case of loss or damage to sails, the owner may petition the Executive Committee for permission to purchase a replacement sail or sails. The owner may also petition the local Fleet to use sails to complete a regatta when damage or loss has occurred. A Cal 20 which crosses 36 degrees North Latitude or 135 degrees West Longitude in either direction to compete in the Class Championship may acquire an additional suit of sails for that purpose. Fleets shall be responsible for making suitable provisions to govern use of sails in local races. All sails shall be measured and stamped prior to use. They shall be stamped on the starboard tack of the sail by the Fleet Measurer with the official Cal 20 stamp. The Fleet Measurer shall include his initials within the insignia, plus the date the sail was measured, date of acquisition, and the hull number. The Chief Measurer shall issue these stamps to all certified Fleet Measurers. Sails which are not stamped, and have the proper information recorded, shall be considered illegal. The Fleet Measurer shall also keep a record of this data. The Cal 20 sail insignia shall be a 15 inch (outside diameter) letter "C" of a two-inch strip width. It shall contain the number "20" in figures 6 inches high and one inch wide. The insignia shall be placed on both sides of the mainsail between the two upper battens. The Cal 20 hull number or USSA sail number shall appear on both sides of the mainsail below the Class insignia in numerals at least 10 inches high. All sail measurements shall be made with the sail stretched sufficiently to remove wrinkles. It is the intent of all sail measurements to prohibit any abnormalities or gadgets intended to increase sail area, such as an indentation on the leech at the point of girth measurement. Any deviation from this stated intention shall be cause for disqualification. 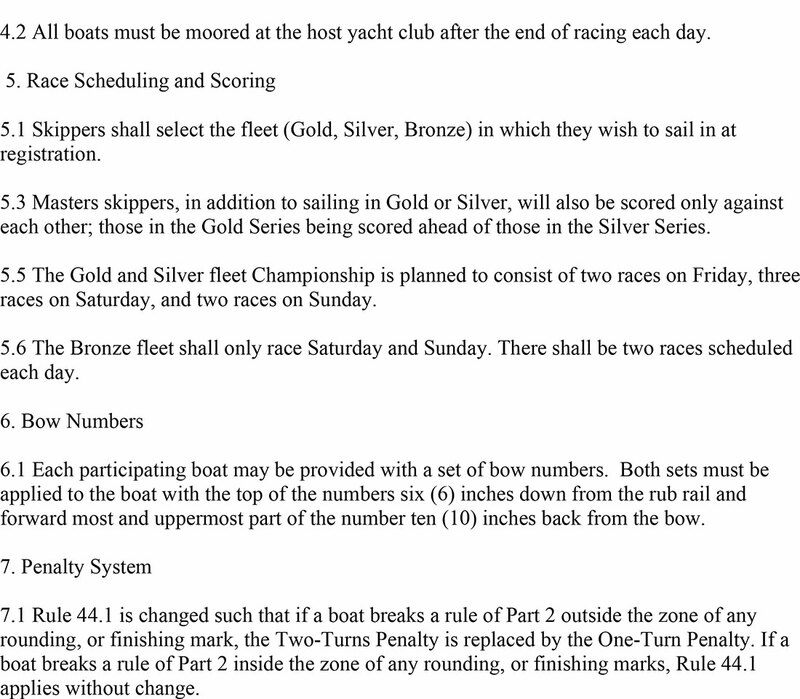 MAINSAIL -- The following rules apply to all mainsails used in competition after January 1, 1999. While racing, the mainsail shall not be stretched beyond the inner edges of the mast or boom bands. The leech dimension, measured in a straight line from the head point to the clew point, shall not exceed 24 feet, 10 inches. The head point is the intersection of the luff at the outer edge of the bolt rope (extended if necessary) with the highest point of the sail, measured 90 degrees to the luff. The clew point is the intersection of the foot and the leech, each extended if necessary. The leech half point is found by folding the head point to the clew point and applying equal tension to the two halves of the leech. The quarter and three-quarter points are found by folding the clew point and the head point to the leech half-point and applying equal tension. Locating a corner measuring point may require the extension of the line of the edges of the sail adjacent to that point. Placing a batten along the edge can often help establish this extension. The position of leech points may be affected by hallows. Where a hallow of more than 3/8 of an inch exits in the vicinity of a measurement point, the sail shall be flattened in that area and the hallow bridged by a straight line. A batten may be useful in establishing that straight line. The head shall have a maximum width of 4.75 inches measured perpendicular to the luff or its extension, including the bolt rope and headboard. The headboard must not exceed 3.625 inches. Upper and lower battens shall not exceed 24 inches. The two intermediate battens shall not exceed 26.5 inches. The use of shock cord, or any similar device in place of or in addition to the normal mainsail bolt rope is prohibited. The cunningham hole shall not be more than 9 inches from the tack. This is measured from the bottom edge of the cunningham grommet to the bottom edge of the foot bolt rope. An adjustable leech cord to control the leech of the main is permitted. Loose footed mainsails are not allowed. The mid-girth of the jib, measured from the mid-points of the luff and leech, shall not exceed 50% of the length of the foot, and any other intermediate girth do not exceed a value similarly proportional to its distance from the head of the sail. The maximum width of the head shall not exceed 2 inches. The head shall be construed as a line projected perpendicular from the luff to the bearing point of the head ring to the leech. The luff, measured from the head of the sail to the bottom of the sail at the tack, shall not exceed 20 feet, 2.25 inches. The leech, measured from the head of the sail to the bottom of the sail at the clew, shall not exceed 18 feet, 2.25 inches. Maximum luff length is 20 feet, 6 inches, from the bottom of sail at the tack to the intersection of the projected luff line with the projected leech line. The luff-to-clew dimension (LP), from the edge of the sail at the clew to the edge of the sail at the luff, measured perpendicular to the luff, shall not exceed 8 feet, 5 inches. The foot roach shall not exceed 10 inches measured from the edge of the sail to a straight line between the tack and clew intersection, and must follow a fair curve. The jib shall be attached to the forestay with hanks not closer than 12 inches and not further apart than 60 inches. If cloth hanks are fitted, they shall not be wider than 1.5 inches. The use of zipper luffs or other techniques to fully enclose the headstay shall not be permitted. The jib leech may be supported by a maximum of three equally spaced battens, each with a length of not more than 12 inches. The leech of the jib may not be convex. Adjustable leech and foot cords are permitted. All Cal 20 one-design races shall be governed by the Racing Rules of Sailing (RRS), including the US Sailing prescriptions. If the RRS conflict with Association rules, the latter shall prevail. Local Fleet rules shall not apply in inter-Fleet races. The 720-degree turn penalty as described in the RRS will apply to all regattas unless otherwise specified by the Class Association or the organizing authority. Maximum length­8 feet, 6 inches including fittings. Made of aluminum or wood. When set, the whisker pole shall only be connected to the mast and jib. Equipment or rigging to control whisker pole movement is not allowed. Whisker pole launchers are not allowed. Kelp cutters/pushers are not allowed. During a race, neither the headstay, shrouds, nor jumpers shall be adjusted. The use of any device, including the crew's hands or bodies, to change the tension on the shrouds is prohibited. Hiking straps are not allowed. The crew's use of any rope, wire, handhold or special device, other than the jib sheet and/or main sheet (held solely in the crew's hand) for the purpose of supporting the crew's weight outboard, is prohibited. Footrests placed inside the cockpit are permitted. No person's torso may extend below the rub rail or its imaginary extension parallel to the horizon. The headsail may not be changed during a race, but it may be dropped for the purpose of de-powering. Electronic devices that can combine information from two or more sources, compare mathematical information or have a memory are not permitted. Adjusting the backstay is permitted at any time. There shall be no penalty less than disqualification for any proven violation of a published Association rule. This penalty is obligatory. The responsibility of knowing the rules rests with the member. A transom mounted batten or "backstay whip" to hold the backstay away for the boom while jibbing is permitted. An adjustable mast step that allows variations of the "J" measurement is not allowed. Shaving or rounding the leading edge of the mast base to facilitate rocking the mast forward is allowed. All required government safety equipment must be carried. This includes a Type 1, 2 or 3 life preserver for each person; a bell, whistle or a horn; one throw-able Type 4 life preserver; and one fire extinguisher (if an engine or fuel is carried). Suitable ground tackle must be carried on board at all times. The minimum allowable ground tackle is an 8-pound Danforth anchor or its equivalent, with 10 feet of 3/16 inch chain and 100 feet of 3/8 inch nylon line. The name shall be the California 20 Class Association, hereafter referred to as the Cal 20 Association. Its objective shall be to promote Cal 20 racing under the rules of this Association, and to vigorously protect the one-design features of the Cal 20 as designed by C. William Lapworth, built by Jensen-Wenke or its successors, and configured as allowed by the Association Bylaws. To cooperate with other yachting organizations. To insist on strict observance of the Association rules. To promote fair competition in Cal 20s so the skill of the skipper and crew will be rewarded. Everything in the Specifications, Constitution and Bylaws is intended to foster racing in boats that are one-design in all critical areas, such as hulls, foils, weight and sail plan. To keep the cost of acquisition and upkeep of Cal 20s within modest limits without sacrificing high standards of performance and seaworthiness. The Association has jurisdiction over all Cal 20 Class competition. Its rules govern all Cal 20 one-design races regardless of by whom they are conducted. Its Constitution and Bylaws are binding upon all members and Fleets, and all registered Cal 20s must conform to the Specifications and Rules. Each Fleet is a territorial unit open to all eligible persons within that geographical area. Fleets elect their own officers, which must include a Fleet Captain, Fleet Secretary and a Fleet Measurer. The Fleet is self-governing in all local matters not conflicting with Association rules. The annual meeting of each Fleet shall not be later than December first of each year and the results of the election of Fleet officers shall be filed with the Association within two weeks thereof. Three or more owners representing three or more Cal 20s outside the territory of a chartered Fleet may charter a new Fleet upon application to the Governing Board. All of the applicants must be members of the Association. Fleet charters may be granted or suspended by the Governing Board. Charters may be revoked for failing to maintain the minimum number of members and/or the minimum number of Cal 20s as required by section 3 above, or for other cause. Revocation of Fleet charters shall take place at the Association's annual meeting. An ACTIVE Member has the privileges of holding office, voting and may skipper a Cal 20 in sanctioned races. He or she must be a Corinthian and at least a one third owner of a Cal 20. Active Membership is extended to the spouse and immediate dependent family members. A Cal 20 skipper shall join the Association through a Fleet on whose waters he or she normally sails. Active Membership is retained until the end of the year in which he or she ceases to own a Cal 20. An UNATTACHED Member must meet all the requirements for Active Membership except that he or she is not within the territory of a chartered Fleet. Unattached Members are entitled to all privileges of Active Members except Fleet representation. Unattached Membership is not offered to Cal 20 owners in a locality in which there are three or more Cal 20s in close enough proximity to permit racing together. An ASSOCIATE Member is a Corinthian who regularly crews on a Cal 20 but is not a Cal 20 owner. He or she cannot vote, hold office or represent the Fleet as a skipper, but may as a crew. A SUSTAINING Member is usually a non-owner of a Cal 20, who joins the Association because of an interest in the welfare of the class. He or she may not vote, hold office, or represent a Fleet. 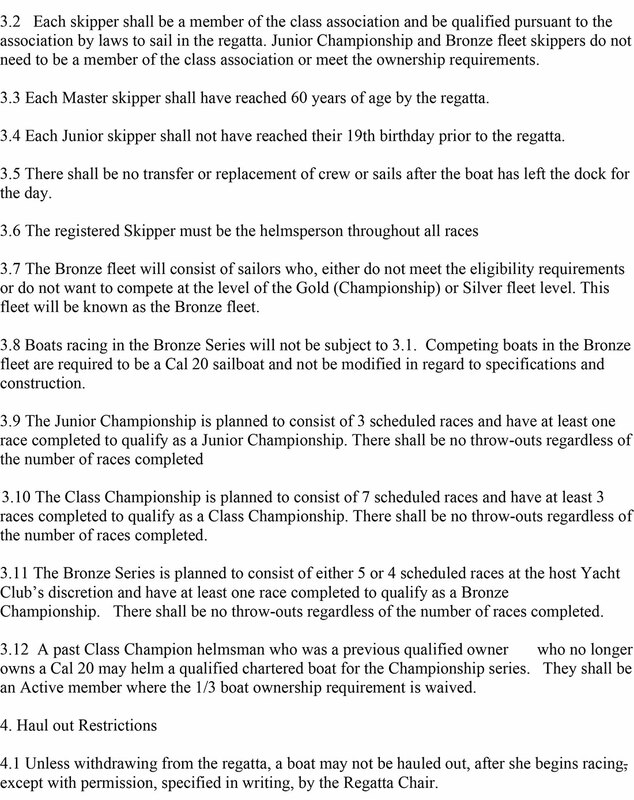 A SPECIAL Member may skipper a Cal 20 in sanctioned races even though he or she is not an owner of a Cal 20. These memberships are granted individually at the sole discretion of the Association's Board of Directors to people from non-profit organizations who use Cal 20s for community betterment programs. The Board of Directors may rescind a special membership at any time. A member cannot belong to more than one Fleet, nor can a Cal 20 be registered in more than one Fleet. Active Members: $35.00 per year. Unattached Members: $20.00 per year. Associate Members: $20.00 per year. Sustaining Members: $20.00 per year. Fleet dues are optional and shall be fixed, collected and retained by the Fleet. Both Association and Fleet dues must be paid for a member to be in good standing of either organization. Dues are payable in January, collected by the Fleet Secretaries and forwarded to the Association. The Fleet Secretary shall maintain a record of each Cal 20 within the Fleet, showing hull number, name, and ownership. The Association shall not be liable for any debts contracted by its Fleets or officers other than expenditures authorized by the budget or upon written order of the President or Secretary. The Association's Executive Officers shall be elected by a mailed ballot and serve for one year from October 1 to September 30. The PRESIDENT is the chief executive and shall preside at meetings, serve as chairman of the Executive Committee and the Governing Board, rule on procedures and jurisdictions, summarize decisions, appoint special committees and authorize the payment of all bills. The VICE-PRESIDENT shall officiate in the absence of the President. The SECOND VICE-PRESIDENT shall officiate in the absence of the President and the Vice President and shall edit the Association's official publication. The SECRETARY shall handle all correspondence, record the minutes of meetings, maintain an accurate and up-to-date record of all members, Fleets and registered Cal 20s, and perform all duties pertaining to this office. The Secretary shall maintain the master copy of the Constitution and Bylaws, revise and update these documents by October 1 of each year and distribute copies to the membership as soon as possible thereafter. The TREASURER shall deposit funds in the depository approved by the Executive Committee, keep the Association's financial books and securities, and disburse funds only on the order of the President. The CHIEF MEASURER shall accept or reject all measurement certificates and shall issue duplicate certificates when appropriate. He or she shall have the prerogative to delegate the above authority and duties to Fleet Measurers. The Chief Measurer shall serve as chairman of the Measurement Committee and have the authority to interpret the Bylaws regarding measurement issues, and the duty to do so when requested in writing by an Association member. These duties pertain only to Cal 20 one-design racing­not racing under handicap rules. The immediate PAST PRESIDENT of the Association is a member of the Board of Governors for the 12 months following his or her term as President. The GOVERNING BOARD shall serve for one year, October 1 to September 30, and shall consist of the Executive Officers of the Association and the Fleet Captains. The President shall be Chairman of the Governing Board. A majority vote shall decide all issues. The Governing Board shall interpret the Constitution and Bylaws, conduct all business, set dues, determine policy of the Association and adjudicate Constitutional disputes. It has the power to enforce its decisions by suspensions of individual members or entire Fleets. Its rulings are final and binding. The EXECUTIVE COMMITTEE is appointed by the Governing Board and is empowered to act for the Governing Board in matters requiring prompt action and personal discussion. The Executive Committee shall consist of the President and two or more Governing Board members. The President shall serve as chairman. The Executive Committee shall render final decisions on appeals from race committees, sanction or ban races or other activities, determine the eligibility of committees, grant charters, create or alter territorial limits, fill vacancies in office subject to ratification by the Governing Board in case such vacancies are being filled by a member or members of the Executive Committee, impeach Fleet and Association officers subject to ratification by three quarters of the Governing Board when a Governing Board officer is involved, suspend any member guilty of a gross violation of rules or unsportsmanlike conduct for a period not exceeding its term in office, and approve the purchase and sale of securities and depositories. The Executive Committee is empowered to simplify, clarify or correct the language of any article of the Constitution or Bylaws if the intent or purpose remains unchanged. The CLASS CHAMPIONSHIP COMMITTEE shall make arrangements for the annual Class Championship series. It will be appointed by the President at the time he or she assumes office. It shall have a minimum of five members including at least three members of the Governing Board plus the Fleet Captain of the host Fleet. The BUDGET COMMITTEE shall consist of President, Secretary and Treasurer of the Association. This Committee shall prepare a budget for the ensuing year, which when approved by the Governing Board shall be published. The MEASUREMENT COMMITTEE shall be appointed by and serve at the direction of the Chief Measurer, assist in the duties of the Chief Measurer and rule on measurement inquiries and protests. If possible, an ANNUAL MEETING shall be held in conjunction with the Class Championship regatta. SPECIAL MEETINGS must be held when ordered by the Governing Board or upon demand in writing by 25 percent of the Fleets. At a special meeting, no business can be transacted other than the stated purpose for that meeting. QUORUM: One half of the Fleets in good standing constitute a quorum at Association meetings. If a quorum exists at roll call, it exists throughout the meeting. Written ballots will be mailed in June to all Association Active Members as of June 1. This ballot will allow members to vote for the Association officers for the following year and on proposed changes to the Cal 20 Constitution or Bylaws, if any. Partners in a boat must vote as a single entity-one vote per boat. Returned ballots must be postmarked prior to September 1 to be counted in the tally. A simple majority of the votes cast is required to change the Constitution or Bylaws, and those changes become effective on October 1. The Association President shall appoint a nominating committee which will present a slate of officers prior to June 1 for inclusion on the ballot. Any Active Member of the Association may nominate a willing Regular Member, including himself or herself, for any office. Such nominations must be sent to the Secretary of the Association prior to June 1 for inclusion on the ballot. Changes recommended by the Cal 20 Association's Governing Board. Changes recommended by a referendum signed by no less than 10 Active Members of the Cal 20 Association. Such a referendum must be submitted to the Association Secretary prior to June 1. A member may be expelled only by a three-fourths majority vote at a sanctioned association meeting.